The historic stucco-clad masonry structure was experiencing a variety of infiltration and degradation problems. Corrosive expansion of the steel lintels was causing cracking in the supporting masonry walls. Hand-sketched details illustrated recommended retrofitting of masonry flashings to correct leakage. Project Summary:	A major remodel combined with a substantial expansion of this historic retirement home were being designed by Mithun Partners Architects when PL:BECS became involved. The existing structure, with 5 above-ground levels, was experiencing a variety of infiltration problems scattered throughout the building. 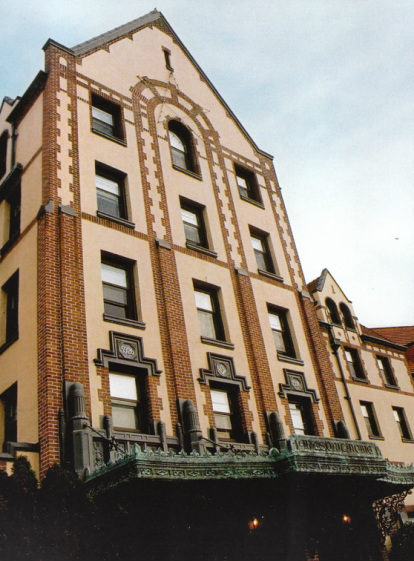 The existing structural masonry and concrete building was clad with stucco and brick, with steeply-sloped tile roofs as well as a variety of low-slope roof technologies. In addition, new buildings were planned with concrete, wood, and metal-framed walls, clad with stucco and metal siding, sloped standing seam metal roofs, low-slope roofs, and waterproof decks. PL:BECS Services:	PL:BECS provided a variety of services over many years. Initial services included detailing recommendations for the stucco-clad walls of the planned new buildings. PL:BECS provided detailed guidance, including color-coded, sequenced installation drawings, for many critical conditions. The second phase consisted of a complete review of all proposed exterior assemblies, as well as specific recommendations for modified assemblies, for the various newly-planned buildings. This was followed by an evaluation of the existing building’s exterior envelope components, including an analysis of the various infiltration and degradation issues plaguing the building. This preliminary evaluation uncovered evidence of serious corrosion of the steel lintels supporting the masonry construction above window and door openings, and recommended that openings be made to determine the severity of this problem. Finally, PL:BECS also provided the more detailed evaluation of these steel lintels, as well as of all exterior envelope components of the existing building. This confirmed serious, in places structurally significant, degradation of the steel lintels, uncovered localized but dangerous seismic damage, and found numerous previously unknown leaks affecting the building. Detailed corrective recommendations were also provided. The PL:BECS report included color-coded building elevations identifying lintel corrosion severity.